EL CAJON – Just two days after seeing their 13-game unbeaten streak come to an end, the Grossmont Griffins got back at Mt. San Jacinto on Saturday in a 13-0 win at Noel Mickelson Field. Mt. 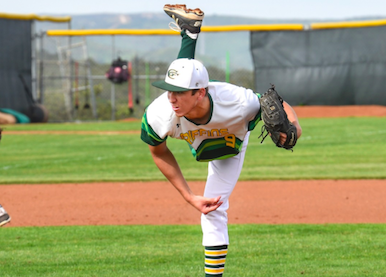 San Jacinto stunned the Griffins on Thursday, pounding Griffins’ pitching in a 13-7 decision. On Saturday, DAVID MALDONADO homered and kept his incredible run-producing numbers going, while MICHAEL DIFFLEY drove in three for the Griffins with a pair of doubles. Maldonado connected for a solo shot in the fourth inning. DONAVAN MCCRYSTAL allowed four hits over seven innings to improve to 5-1 on the season. The sophomore walked two and struck out two. Catcher TREVOR BEARD had three hits, two RBI and two runs scored. ERIC DE LA ROSA scored three runs for SoCal seventh-ranked Grossmont (11-1, 16-6-1), which is currently tied for first in the PCAC with Palomar. In Thursday’s loss, Mt. 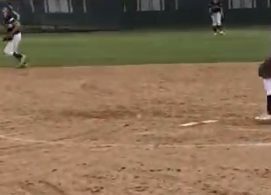 San Jacinto peppered eight Grossmont pitchers for 13 hits and drew 11 walks in an 18-7 rout. It was Mt. San Jacinto’s first conference win of the season and the Griffins’ first conference loss. NOAH STROHL hit a two-run homer for Grossmont in the seventh, but the Griffins fell behind 11-2 in the fifth. D. Maldonado homered to left field, RBI. T. Beard singled to right center, RBI; E. la scored. R. Bostedt singled to center field, RBI; N. Strohl advanced to second; R. Hernandez scored, unearned. M. Diffley doubled to left field, 2 RBI; R. Bostedt scored; N. Strohl scored. E. la doubled to right center, RBI; M. Diffley scored. T. Beard singled to center field, RBI; E. la scored. R. Hernandez singled to left field, 2 RBI; D. Maldonado advanced to second; C. Fullen scored; T. Beard scored. J. Burkey reached on a fielder’s choice to shortstop; R. Bostedt advanced to second; R. Hernandez advanced to third; D. Maldonado scored, unearned. D. Maldonado singled to left field, RBI; C. Fullen advanced to second; T. Beard scored. M. Diffley doubled to left field, RBI; J. Burkey scored. C. Fullen reached first on a fielding error by ss, RBI; E. la scored. Robert Bostedt tripled, RBI; David Maldonado scored, unearned. Marino Rojas reached first on an error by ss; Anthony Garcia advanced to second; Steven Ybarra scored, unearned. Luke Reinert reached first on an error by ss; Marino Rojas advanced to third; Anthony Garcia scored, unearned. Brock Partain reached first on an error by 1b, advanced to second on the throw, bunt; Luke Reinert advanced to third; Marino Rojas scored, unearned. Michael Alonzo singled to right field, 2 RBI; Brock Partain scored, unearned; Luke Reinert scored, unearned. Steven Ybarra walked, RBI; Abraham Rascon advanced to second; Nick Brock advanced to third; Michael Alonzo scored. Anthony Garcia singled to center field, RBI; Steven Ybarra advanced to second; Abraham Rascon advanced to third; Nick Brock scored. Reece Hernandez grounded out to 2b, RBI; Cabot Van Til advanced to third; Trevor Beard scored. Anthony Garcia singled to left field, RBI; Steven Ybarra advanced to second; Brian Wolford scored. Marino Rojas singled to right field, RBI; Anthony Garcia advanced to third; Steven Ybarra scored. Luke Reinert doubled, 2 RBI; Marino Rojas scored; Anthony Garcia scored. Michael Diffley out at first 1b to 2b, SAC, bunt, RBI; Justen Burkey advanced to third; Robert Bostedt scored. Justen Burkey scored on a wild pitch. Noah Strohl homered, 2 RBI; David Maldonado scored. Luke Reinert advanced to third on a passed ball; Marino Rojas scored on a passed ball, unearned. Nick Brock singled to left field, RBI; Michael Alonzo advanced to second; Luke Reinert scored, unearned. Abraham Rascon tripled to left center, 2 RBI; Nick Brock scored; Michael Alonzo scored. Abraham Rascon scored on a wild pitch. David Maldonado singled to left field, RBI; Trevor Beard advanced to second; Michael Diffley scored. Anthony Garcia advanced to third on a wild pitch; Steven Ybarra scored on a wild pitch. Luke Reinert singled to second base, RBI; Anthony Garcia scored.